If you are an enthusiast for American art, then London has served you well in recent times. 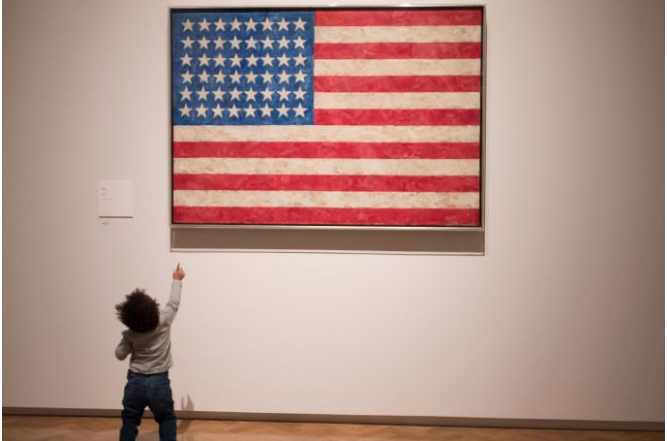 Tate Modern has delivered a series of mighty American shows: Georgia O’Keeffe, Robert Rauschenberg, Soul of a Nation. The Barbican has waded in with a noisy Basquiat celebration. And the Royal Academy hit rare heights with its thunderous Abstract Expressionism and the fascinating America After the Fall. If you didn’t know much before about American art, you should now. 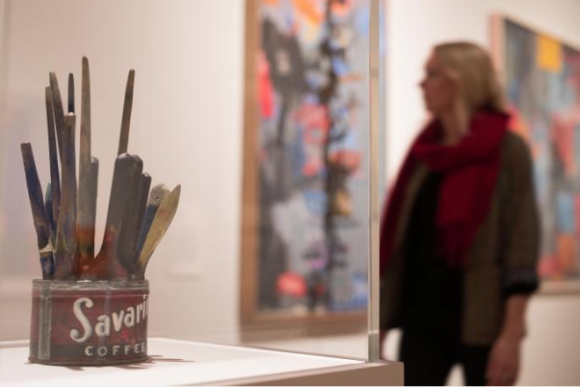 Yet the Jasper Johns retrospective that has arrived at this same America-hugging Royal Academy feels as if it has been squeezed out of a different tube of toothpaste. Yes, he’s from Georgia; yes, he’s the same generation as Warhol and Rauschenberg; yes, he has made art out of the American flag and cans of American beer. But his atmosphere is so different — so complex, unhurried, pale of tone, light of touch, thoughtful, poetic, gently philosophical — that it calls for a passport check. Compared with most American art, Johns is a slice of fugu surrounded by hamburgers. Born in Augusta in 1930, he was a parcel kid, passed from mother to aunts to grandparents in a Depression- era childhood that transferred to South Carolina. Art did not initially figure in his life, he remembers, and was understood only as the opposite of what he was going through. And from beginning to end of this quiet but brilliant show at the Royal Academy, you feel you are in the presence of an artist for whom art was salvation. Indeed, the firmness with which he clings to the mysteries of art is almost the only firmness there is at this slippery event. 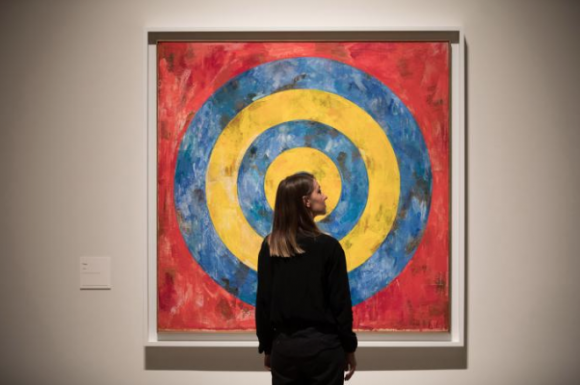 His fame rests principally on the work he produced in the 1950s, when he presciently prefigured pop art. His celebrated American flags and brightly banded targets are seen as examples of a Warholesque aesthetic arriving early. By 1960, years before Warhol’s soup cans and Brillo boxes, Johns was already including perfectly observed cans of beer in his art. 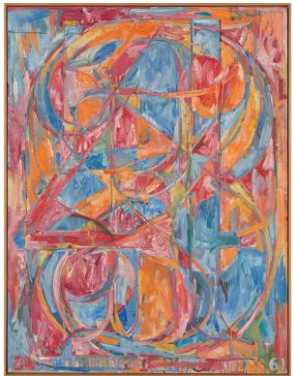 But, as this intricately plotted display makes quickly clear, no trace of pop-art ambition ever guided the hand of Jasper Johns. He was always deeper than that. Though this isn’t a chronological retrospective, preferring to divide his output into thematic clusters, we do indeed begin with the definition-challenging flags that he started making in 1954. Apparently, he dreamt one night of painting the Stars and Stripes, so the next morning he got up and did it. They were made with encaustic — hot wax mixed with pigment — rather than more usual paints. The famous spangles and hoops were blocked in briskly across a collage of browning newspapers, with just a hint of disrespect. Encaustic is hot when you apply it, but dries to an oily sheen. So it differs from other paints in having about it a sense of trapped time. It’s like cleaning up after a dinner party and finding that the wax from a candle has melted onto a newspaper: yesterday preserved for today. Which is perhaps why the Romans used it in their famous mummy portraits of Faiyum. So, although these seem at first to be nothing more than full-size reproductions of the Stars and Stripes, a closer inspection reveals a range of complications. The American flag is a striking design, but the encaustic messiness with which Johns records it turns it into something blurry and homemade. Its emblematic catchiness, that pop-art look, doesn’t seem to be the point, either. Instead, the waxy flags feel somehow as if they are questioning reality. Rather than emphasising the given meanings of the Stars and Stripes, the greasy mimicries appear to challenge them. The show ahead spends most of its time challenging visual certainties. The targets that follow the flags, the maps that follow the targets, the numbers that follow the maps, are all signs whose prosaicism, you would have thought, was inviolate. But Johns manages to discover complex poetry in all of them. In his Numbers pieces, all he does is find different ways to present the count from zero to nine in paintings, sculptures and wall reliefs. Conceptually, there is a tiny pleasure to be had by completing the sequence in your head, but the only way a painting of numbers from zero to nine can be truly worthwhile is if the actual mark-making — the touch of the artist — is persuasive and magnetic. And it is here that Johns scores, and keeps scoring. From start to finish, his pale, feathery, slightly nervous touch is the star of the show. Like a great soprano who can make the recital of a shopping list sound Mozartian, his touch is transformative. As I said, the journey passes through different thematic clusters. The gallery called Painting as Object is filled with art that ruminates upon the reality of art. A work called Canvas is the back of a canvas, wistfully blank and presented as if it were the front. Next to it hangs another of the stars we have already encountered in the American flag, except this time it is made of wood, taken apart and shown to us hollow side up. So we are in a Magrittian world in which une pipe is not une pipe, but a painting of une pipe. But where Magritte is content to be playful, Johns appears always to be agonising over important perceptual issues. It’s conceptual art, but conceptual art freighted with weighty visual ambitions. The room devoted to Words and Voices features various exclamations stencilled onto the canvas in a declamatory fashion. “Red,” it says over a splodge of blue. “Blue,” it says over a splodge of red. A quick perusal of the wall texts reveals that, yes, he has been reading Wittgenstein, and yes, we are skating with him across the frictionless ice of language. But once again it is the mark-making, the scratchy and haunting touches, that achieve an edgy beauty. Here and there among the word games, a word will explode with something harder. “LIAR,” it says unexpectedly on a beautiful expanse of trademark grey. “NO,” it says in the next painting along. Both pictures were apparently a response to the break-up of his intense love affair with Robert Rauschenberg. Both disturb the quietude of the show like blasts from a cannon. In the 1980s, Johns begins quoting the work of other painters in his pictures — Leonardo, Picasso — as if measuring himself against them. In the final rooms, devoted to Seasons and Cycles, the mood becomes almost William Blake-like with its troubled awareness of time. As the starkness of the exhibition gives way to busier imagery, a sense grows that we are actually in the presence of a visionary. Bridge looks at first like a school blackboard on which Brian Cox has been teaching. This is a galaxy. That is the Plough. This is a piece of string measuring out a catenary curve. It’s just a cluster of signs and hints, but it prompts things and makes you feel as if you are staring up at the cosmos, wondering what it’s all about.